I am your no.1 fan. 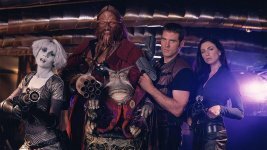 Your SciFi Universe is: Farscape! Your SciFi Universe is: Farscape!. Peacekeeper Scum! Only joking! I know you’d never work for those scum, instead you’d be stood with your companions on the Leviathan, Moya. You love riding around in Moya, the pinnacle of organic ship design and wouldn’t trade places with the old tech for you life; in addition, you don’t mind the tight leather uniforms! Take or re-take the quiz again, find out which SciFi Universe you’re at home in – click here!